Finished! 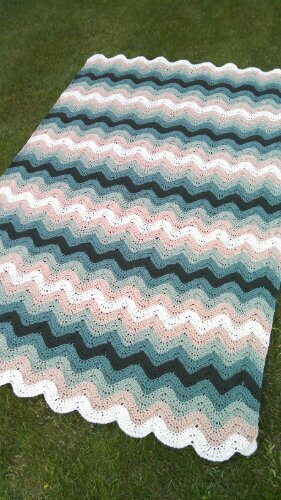 Ocean Waves Afghan Challenge… Whew!!!! Just in time!! 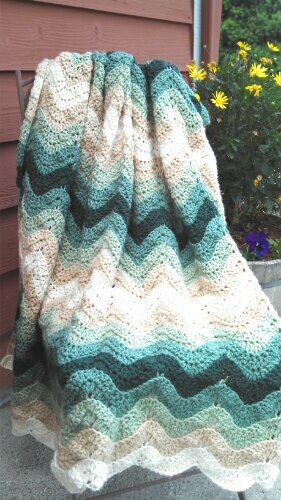 I finished up my Ocean Waves Challenge Afghan last night… Took pictures today and submitted it to the contest! It turned out just the way my daughter wanted too! She chose the color scheme and the way the color changes took place… I think she did a great job, and all I had to do is whip it up in one months time! It feels great to have finished, time to move on to other projects now!! I used Red Heart Yarn in Creams and Greens… It turned out so soft too! My daughters 17th birthday is on Monday,,, Finished just in time to wrap it up and present it to a beautiful young woman! Here is toFfinishing Challenges, Ocean Waves and Birthdays! Crochet With Me… Weekly Crochet~A~Long.. Week 4!! Beautiful! Happy Birthday to your beautiful daughter. I’m sure she will treasure this lovely gift from “Mom” always. How pretty! It is always nice to finish on time. This is gorgeous!! Your colors are beautiful, and it looks so super cozy. I’m glad to have found you through the May Made It Challenge. Very pretty – love the color layout! Thanks so much for linking up on Hookin On Hump Day again this week!